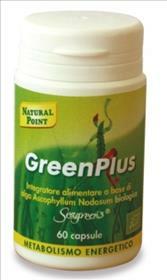 Natural Point GreenPlus is based on Seagreens® Ascophyllum, of which the product is 100% Seagreens in capsule form. There is high nutritional value of this seaweed (rich in vit. A, C, D, E, K, B-group vitamins, minerals, amino acids and essential fatty acids) making it useful as a support in dietary regimes aimed at weight loss.